What Does Your Future Hold? 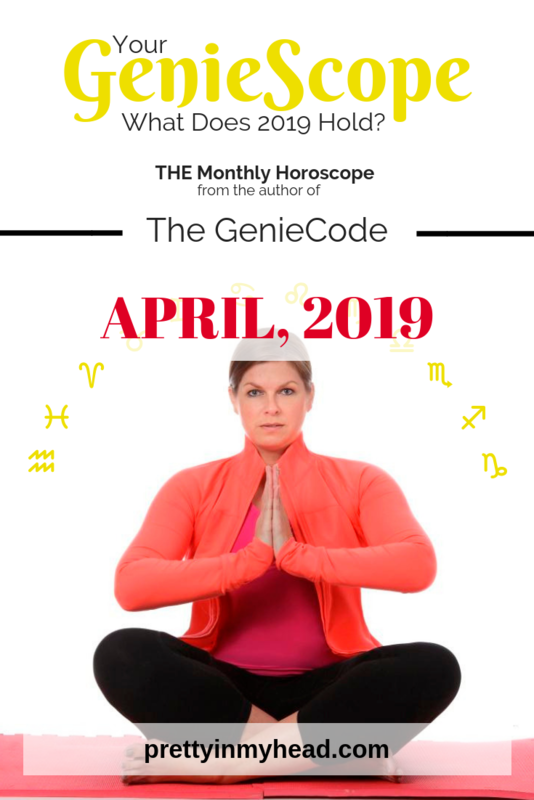 Your APRIL GenieScope is Here! - PRETTY IN MY HEAD BLOG | A Funny New Beauty and Lifestyle Blog: A beauty blog with a twist. Fun look at Beauty, Lifestyle, and Fashion with humor. The World is at your feet Capricorn! You can make your life anything you want it to be this month and your Genie will deliver. This is only the beginning of luck and success for you. Have you been wondering when your finances will start to improve? April is the month you receive good news. That bonus you have been waiting on? It is heading your way. Expecting a refund check? It is in the mail to you. Your mailbox should be full of checks payable to You! When life brings you challenges, an attitude adjustment will go a long way in helping you cope. You need a different approach in how you look at obstacles. They might not seem as bad as you first thought! Sometimes you just need to resign yourself to the fact that certain people in your life will never change. It will need to be you who adapts in order to keep them in your life. You are ready to make a move. Whether your living situation or employment, you have been thinking of this for some time. Once your mind is made up it will happen very quickly! Take time to savor every moment of life. We find ourselves rushing through the day and missing the small things. Roses in bloom. Singing birds. Cloud shapes. The smile of a dog. The Genie is ready to send wealth and prosperity to your doorstep. All you need to do is ask! Try doing the New Moon ceremony, described in The Genie Code, on April 5th to manifest good things into your life! What you long for in life can be yours, quickly! You spend too much time focused on what you don’t want, instead of asking your Genie to bring you what you really want and need. Change your way of thinking about what you are putting out there in the Universe, and you will be pleasantly surprised what you get in return. Change is coming. And it is coming in fast! Sometimes a change in routine scares people, but not you. You embrace it and adapt your life to new experiences. Are you looking for a new love to come into your life? Sometimes there are people who just pass through our lives but bring with them lessons that we can learn. You might need someone to show you that you are ready to love again. Lucky you! The stars are shining down on you this month. Buy a lottery ticket. Apply for that dream job. Put an offer in on that fabulous home. The possibilities are endless! Do you ever wake up and an idea pops into your head? It is a really good idea, one that you could turn into a success! If you go to bed and ask your Genie for assistance in any area of your life, then go to sleep and let the magic work, solutions to problems or a really good idea will be the fruition. All your Genie wants is acknowledgement, and that you moving forward with the tools they give you.